Happy Day-Before-Halloween! 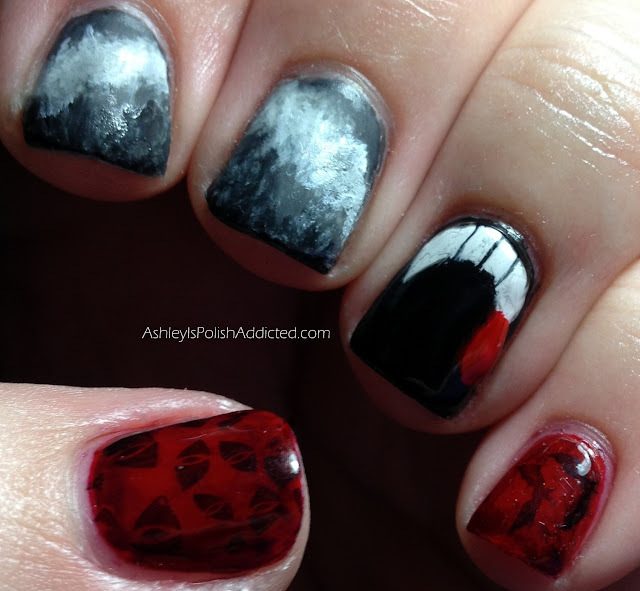 I haven't had much time for Halloween Nail Art this year which makes me sad because I love doing spooky manis. So I figured if I only had time left to do a select few I should choose the ones I was really excited about. And I was very excited for this one! I started watching the original Dark Shadows series (don't even get me started on the movie re-make! LOL) a couple of years ago with my mom (she had watched it as a kid) and I was hooked almost instantly. The story lines are good, the acting is amazing (especially considering they filmed a brand new episode live every day) and I really enjoyed the whole "gothic, spooky" feel of the show. 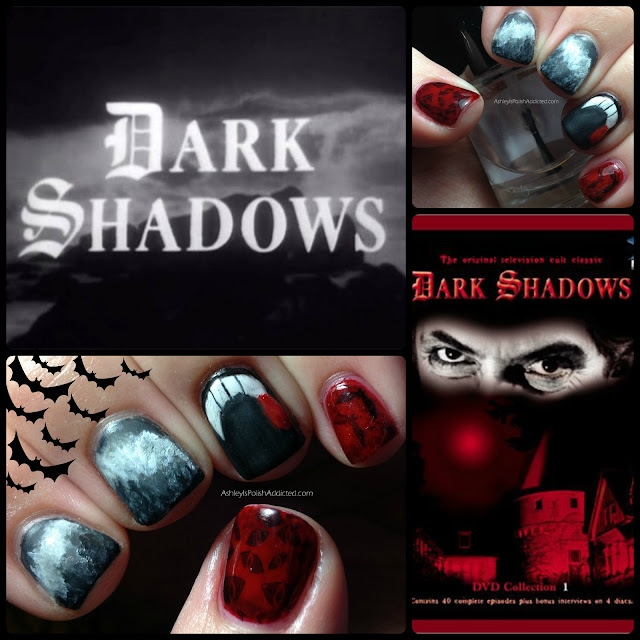 I have wanted to do a Dark Shadows mani for a while but didn't quite know how to go about it. If I were super talented I would have drawn the faces of the characters and maybe Barnabas' Cane but I don't have the skills for that (at least not yet!). So, I improvised. My index and middle nails are my version of the waves crashing against the rocks in the title screen, my ring finger is vampire fangs, my pinkie features bats over a blood red base and my thumb is spooky eyes that reminded me of the photo of Barnabas' eyes on the DVD cover. I am really in love with the red base I created on my thumb and pinkie. I will be recreating it as a full mani soon and giving you all a better look at that. In the first pic I used a matte top coat (butter LONDON) over the black on my ring finger and in the second pic I topped the whole nail with a shiny top coat. So, what do you think? Are you a fan of the original Dark Shadows? I'd love to hear your thoughts! 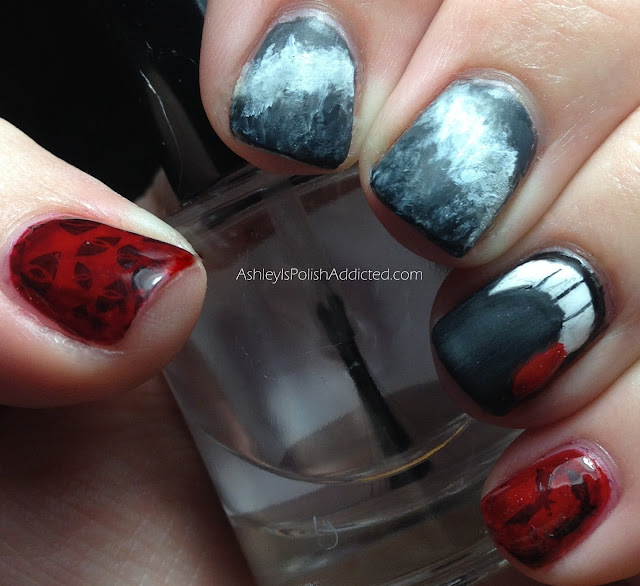 I am hoping to squeeze in another Halloween mani or two! OOOOOOOOH fabulous!!!! I super LOVE Dark Shadows the original TV show and even the remake TV show the movie was AWFUL! This mani is just fantastic!!! I love the fangs! Dark Shadows is awesome! Coolest mani EVER!!! Oh, and I ADORE Dark Shadows. I've been a fan since the mid-90s!